Chapter 4: Out of the Pit | Who Am I? Jesus came to give God and man the opportunity to fellowship again. He came so God could create in a willing man or woman spiritual life. He came to cancel out the debt of sin and death man existed in. Colossians 2:14 tells us Jesus blotted out the handwriting of the ordinances that were against us, nailing it to the cross. God could not raise life in Adam because of his disobedience, but God could give life back to a child of obedience, Jesus. To do this Jesus would have to give himself to death without committing sin in any way in obedience to God. God would accept his sacrifice of life and shedding of blood for the human race. Understand this, Jesus walked in authority and power as the Son of God. John 10:17-18 says,” Therefore doth my Father love me, because I lay down my life that I might take it again. No man taketh it from me, but I lay it down of myself. I have the power to take it again. This is the commandment I have received of my Father. “ Matthew 26:52 says Jesus could have called 12 legions of angels to deliver him but he did not. And so fulfilled the Father’s will and plan. “And he went a little further, and fell on his face, and prayed, saying, O my Father, if it be possible, let this cup pass from me: nevertheless not as I will, but as thou will,” Matthew 26:39. This is Jesus prayer in the Garden of Gethsemane just before he faced his death on the cross. On the surface it looks like Jesus was repulsed by the death that lay before him, but in reality his antipathy goes much deeper than the physical death at the cross. What was the cup that Jesus would have to drink? To answer this question we must understand that Jesus and the Father God were in perfect communion all the time. Jesus’ joy and existence was in the fellowship with life itself, the Father God. Jesus was God and with God from eternity. The cup that he was about to drink was not just physical death separation from God and Spiritual Life. If just physical death was required to pay man’s debt then Able who was killed by Cain could have been man’s sacrifice or any other man who died a righteous death. But Able was spiritually dead and Jesus was life and sinless and the only begotten of the Father spiritually alive qualifying him as the perfect Lamb of God. Jesus forsook His former glory and emptied Himself in the form of a man just for the purpose of redemption of mankind. He was born for this moment in time to change the fate of mankind forever. Jesus demonstrated his separation from God when he said, “ My God why hast thou forsaken me”. God alienated Himself from his Son for the first and the only time for our sake. He was alone for our gain. Our judgment was upon Him. Jesus who knew no sin became sin for us. When Jesus said,” It is finished” on the cross and gave up the ghost or died physically, the Vail of the Temple of the Jews in the Holy of Holies where the presence of God stayed, was torn from top to bottom. Jesus was declaring the end of things to be done to fulfill scripture concerning his death and the climax of the Abrahamic Covenant between God and man. Jesus was the last Sacrifice. God had given His Only Son. The trap was sprung. Mankind and Jesus appeared to be defeated at the hand of Satan. Next Jesus the Son of God and the son of man, was taken to the heart of the earth to the place of the dead as Matthew 12:39-40 predicted and his body was buried in a tomb. In his death on the cross Jesus defeated Satan and was loosed from the pains of death, Acts 2:24, for death, could not hold him because he had done nothing to deserve death, “For You will not leave my soul in Sheol, Nor will You allow Your Holy One to see corruption”, Psalms 16:10. The price for sin had been paid in full in God’s eyes. On the third day, God quickened Jesus back to life, this is when Jesus spoiled principalities and powers making a show of them openly triumphing over them in it, Colossians 2:15. Satan was mortally wounded in his head as God promised Eve in Genesis her seed would bruise the head of the serpent. 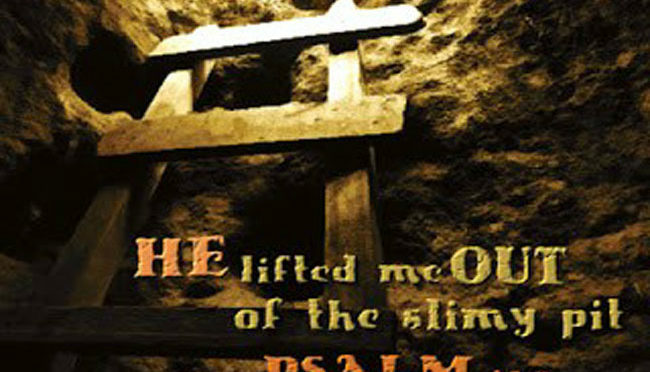 Jesus overcame the gap between life and death taking the keys to death, hell and the grave with him. He preached deliverance to the captives, Luke 4:18 and I Peter 3:18-19. Jesus arose to his body in the tomb resurrected to life. And the bible says that many of the Old Testament saints were seen at this time, Matthew 27:52-53. It is my belief Jesus cleaned out Paradise in Sheol and took the Old Testament saints to heaven with him when he ascended to God in heaven, John 20:17. Jesus was the first born again man. He was the first man to be raised from death unto resurrection life. Just as Jesus said to Nicodemus,” Except a man be born again he cannot see the kingdom of God,” John 3:3. Jesus was speaking of spiritual birth realizing mankind was spiritually dead. In Hebrews 1:5 God says about Jesus,” Thou art my Son this day I have begotten Thee. And again, I will be to him a father and he will be to me a son.” For the Father God to be a father again there must have been brief crack in time when they were separated. Jesus the resurrected restored the glory of the Son that he once had in his relationship with the Eternal Father, but with the scars of man’s sin forever in his body. Colossians 1:18 calls Jesus the firstborn from the dead. Romans 8:29 tells us Jesus was the first-born of many brethren. You begin to understand the importance of what Jesus did. Jesus became the door that man and woman could walk through to eternal life with God. After his resurrection from the dead Jesus was made known to his disciples through Mary Magdalene, then Jesus ascended to the Father in heaven. There Jesus became our High Priest and entered into the Holy of Holies in heaven and cleansed the heavenly utensils with his own blood the perfect sacrifice, for without the shedding of blood there is no remission of sin, Hebrews 9:11-28. A new covenant between God and man was established that day. Hebrews chapter 8 tells us how Jesus became our mediator to God and sets at the right hand of the Father as our High Priest. God instituted a new covenant with man, and God would put his laws into their mind and write them in their hearts. And all men would know him. God would be merciful to their unrighteousness and their sin and iniquities He would remember no more. If any man or woman would accept the blood of Jesus as the complete cleansing from sin, God would raise their spirit from deadness and they would become a new creature in Christ, II Corinthians 5:17. For Jesus was made sin for us that we may be the righteousness of God in Jesus, II Corinthians 5:21. The old English word in the King James Bible “righteousness” means right standing. This means that we are in right standing with God and on our way to completeness in Christ. We are restored to communion with the Father through our regenerated spirit. Man and woman, where have we come from and where are we going? We began in innocence dependant on God who created us. We chose the knowledge of good and evil and listened to the lie that we were gods. We began in perfection in the Garden of Eden. We sinned against God and ourselves then we learned to exist in a world cursed by our actions. We began walking with God and fell to the ground crawling with serpents. We began in trust and responsibility and then we learned disrespect and how to blame others. God gave us all things that pertain to life and we chose death and destruction. We have all been there, we have all fallen short of the glory that God that has for us, but our sin can no longer keep us from God and his blessings. Again it is a choice that God gives us through his Son the Lamb of God. We can choose the redemption that God has provided and inherit eternal life or reject the message of God’s Holy Spirit that says,” This is my beloved Son in whom I am well pleased. I have so loved the world that I gave my only begotten Son, that whosoever believes in him should not perish, but have everlasting life.” Matthew 3:17 and John 3:16. Rejection of this message is the one sin God will not forgive, Matthew 12:31-32, I John 5:16. Just as God said to men of old, set before you is life and death, therefore choose life. If you have never received Jesus as Lord and Savior, or you are out of fellowship with him, accept Jesus or recommit to him today. There is no peace or true joy till this is done. To know your prayers are heard and understand the Word of God through the Spirit of Life, this is God’s will for you. It is God’s will that all come to Him and none perish, II Peter 3:9. In John 10:9-11 Jesus says,” I am the door: by me if any man enter in, he shall be saved, and shall go in and out, and find pasture.10 The thief (Satan) cometh not, but for to steal, and to kill, and to destroy: I am come that they might have life, and that they might have it more abundantly”, (KJV). Accepting Jesus is necessary for a person to have a rich full life. Romans 10:9 says if you confess with your mouth Jesus as Lord, and believe in your heart that he was raised from the dead, then God will raise you from spiritual deadness, and then you will be set free from power of sin and death. Start life anew in the life Jesus gave us. It is that simple. There is no other qualification for new life, confess believe and receive. Don’t make complicated what God made simple. Let God give you a fresh start in right standing and communion with the God of life. There is nothing you can do to earn new life. Jesus won it, we walk in it. We become more than conquerors, Romans 8:37. The battles is the Lord’s, the victory is mine. And nothing can separate us from the love of Christ, Romans 8:35.